Home Prawns/Shrimp Prawn Cocktail !!! Everybody loves a Prawn Cocktail! Prawns (shrimp) tossed in a classic rose coloured Prawn Cocktail Sauce that’s simple to make and way, way better than store bought. So Aussie, so summer, so Christmas, so…..erm…80’s….and we love it!!! PRAWN COCKTAIL – HERE TO STAY! Prawn Cocktails might be a classic from the 80’s but in my books, they have NEVER gone out of fashion and never will! 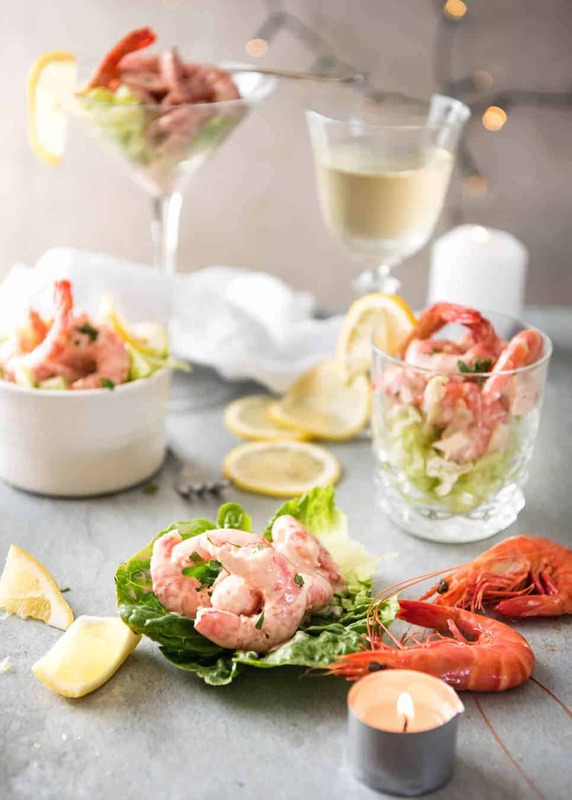 In my younger days, I associated prawn cocktails with posh restaurants and feeling very grown up, eating the prawns out of fancy looking glasses with little forks. I know that nowadays, many posh restaurants do modernised versions of prawn cocktails. Plating them up in a fancy way, with poshed-up sauces (I think I even saw a prawn cocktail foam sauce once!!). I’ve never poshed-up Prawn Cocktails. To me, it’s a classic that is perfect as it is. 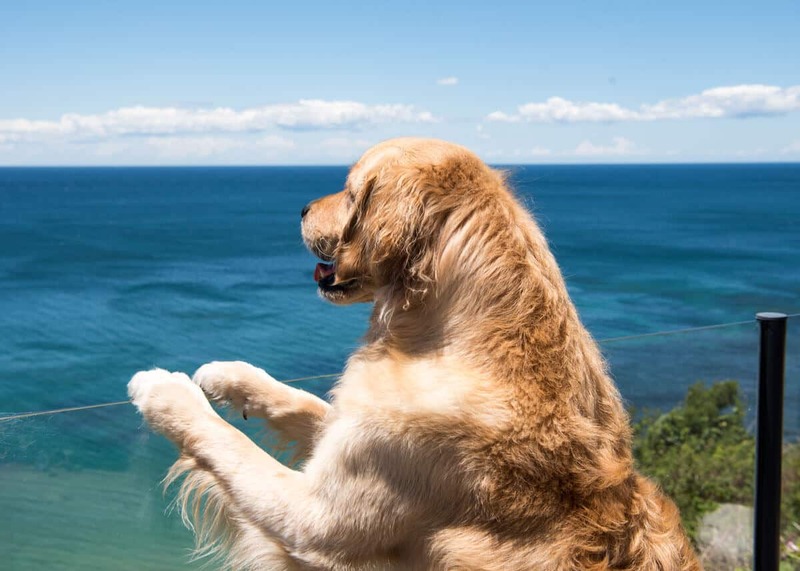 Today’s, it’s a perfect summer day here in Sydney. Clear blue skies, the ocean is crystal clear (though surfers are probably sulking because there is zero surf). 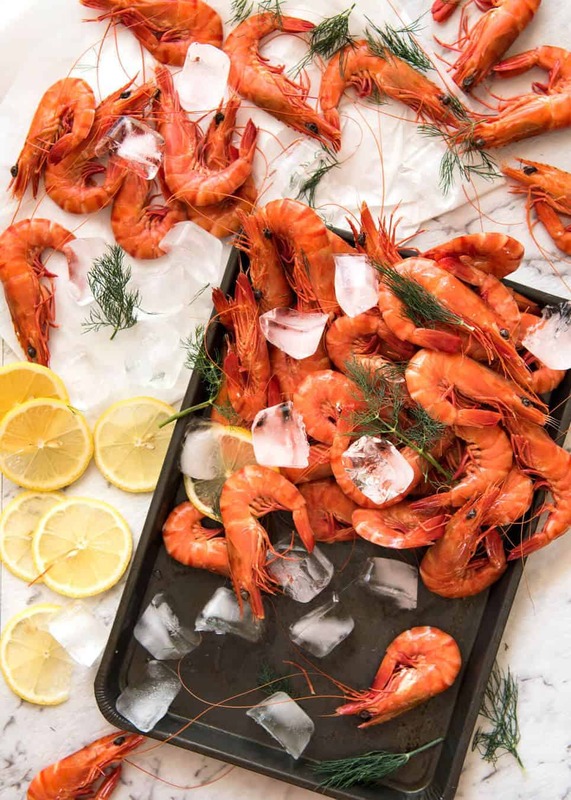 For festive seasons and summer holidays in Australia, the vision of piles of fresh prawns is one that is familiar to many. 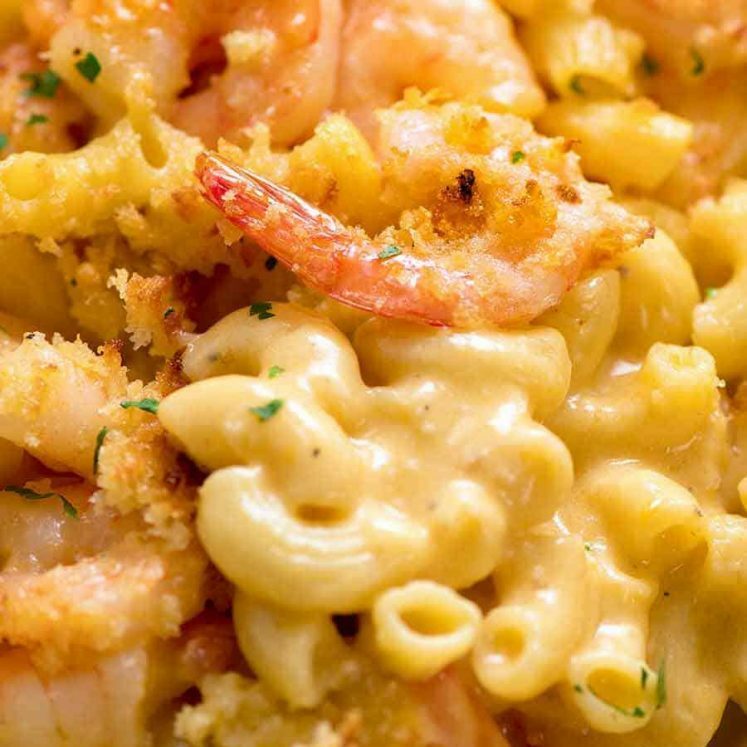 And we all know that there is only one thing better than the sight of a pile of fresh prawns…. Thus the ultimate appeal of Prawn Cocktails. It’s every prawn lovers dream come true because it’s a mound of prawns that someone has already peeled for you! 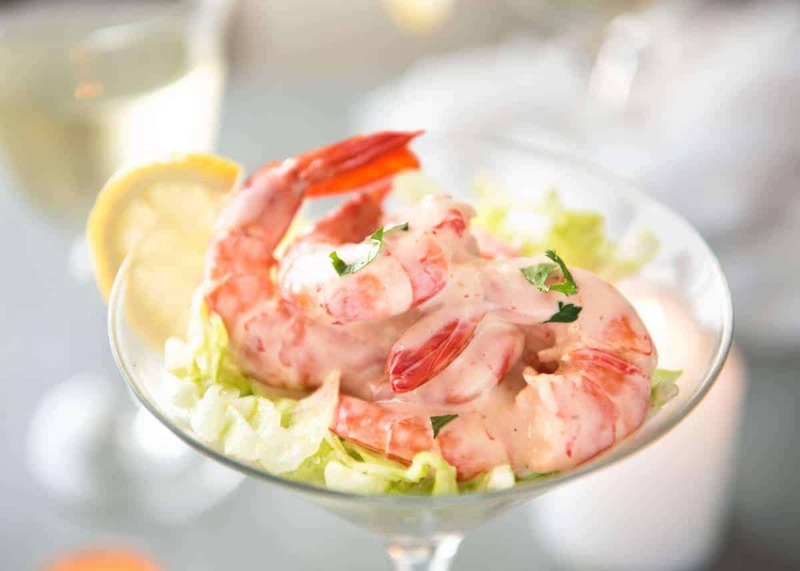 Prawn Cocktails are served with a Prawn Cocktail Sauce (also known as Marie Rose Sauce) which is made of mayonnaise, ketchup and Worcestershire sauce, with optional horseradish. 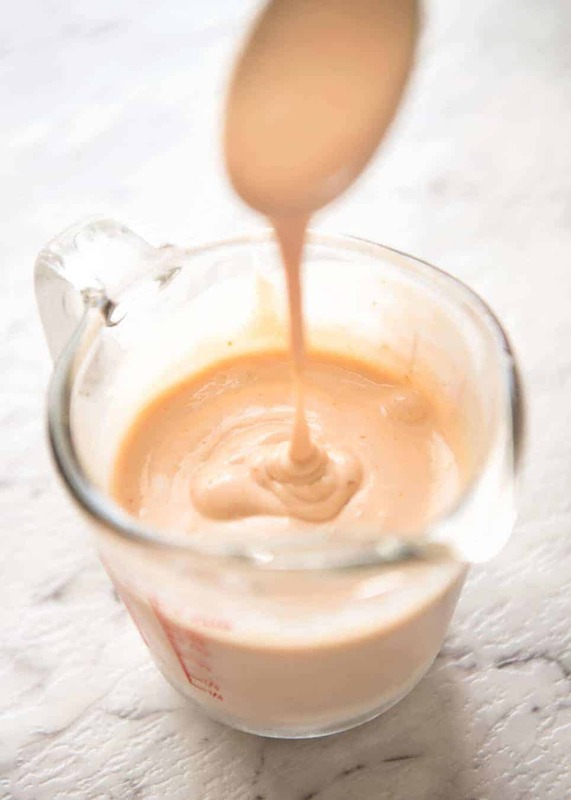 It’s quick and easy to make, and tastes way better than store bought Seafood Sauce which tends to have an artificialness about it and is often too sour. I use Neil Perry’s recipe (he’s a famous restauranteur in Australia). Fab for prawn cocktails but also a great sauce generally for dipping in fresh prawns (here are 5 more Prawn Dipping Sauces! ), or crunchy Coconut Crumbed Prawns, chicken fingers/nuggets, wings, and using on burgers (Beef Burgers, Chicken Burgers, Portuguese Chicken Burgers, Steak Sandwiches and Veggie Burgers). As briefly mentioned above, there are many variations of Prawn Cocktail but I like to keep it classic because it’s great as is! 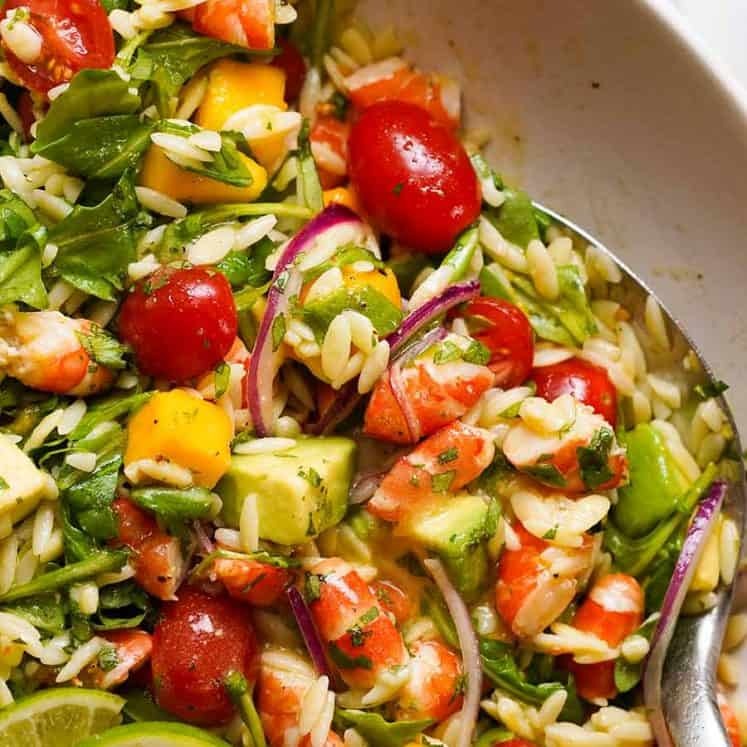 But here are some add in ideas: diced avocado, finely chopped gherkins or dill pickles, a hint of spiciness from sriracha or tabasco in the sauce, diced mango, fresh dill. 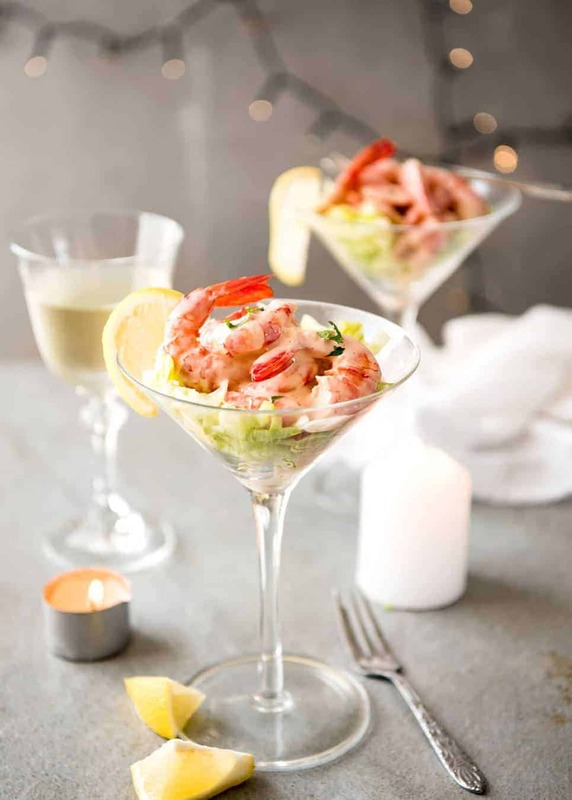 A classic Prawn Cocktail recipe! 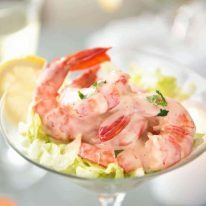 Juicy prawns (shrimp) tossed in a beautiful Prawn Cocktail Sauce (Rose Marie Sauce - a pink mayonnaise). The key to a good Rose Marie Sauce is a good mayonnaise. Use whole-egg if you can find it . (Note 1) A classic Aussie summer festive starter! If you are using whole prawns, remove heads and peel them. Leave a few whole for decorative purposes, if you wish. I find that with medium size already cooked prawns, deveining is usually not necessary (it's hard to do + so small it's barely noticeably especially with sauce). Mix together Sauce in a small bowl. Place a bit of lettuce in serving dishes. I like to use Martini glasses, but you can use any small serving vessel, or even small lettuce cups. Top with prawns. Serve, garnished with lemon wedges and a sprinkle of parsley, if using. 1. Let's talk PRAWNS! The better and fresher your prawns, the tastier this will be. 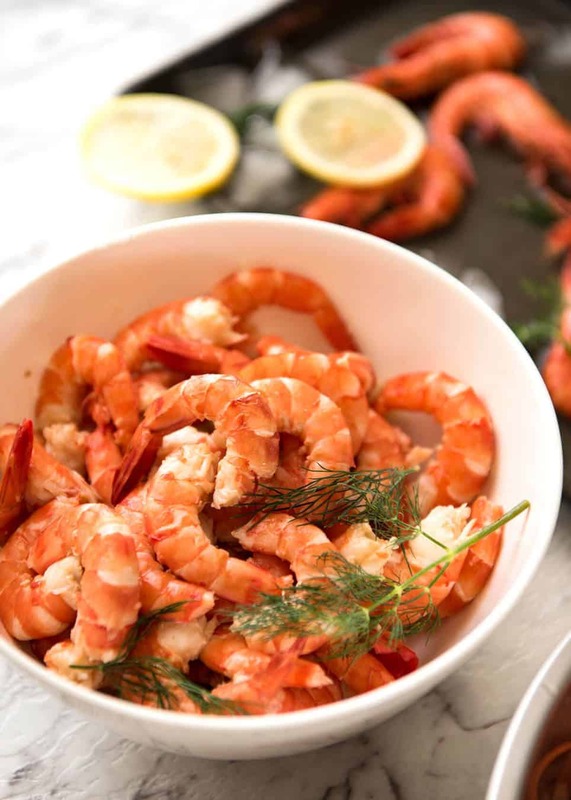 In Australia, seafood stores and even major supermarkets sell really great quality fresh whole cooked prawns. They are basically cooked the moment they are caught, so they are great quality! For a premium, you can purchase them already peeled. But they will be juicier and fresher if you peel them yourself! 2. Whole Egg Mayonnaise is smoother and not as sharp in flavour as classic mayonnaise. It is now widely available in Australian supermarkets - I use S&W (sold at Woolies and Coles). 3. Tomato Sauce in Australia/UK and many other countries outside America is a condiment that is the equivalent of ketchup (just slightly less flavouring spices in it). If you are in America, do NOT use your tomato sauce which is more like pureed tinned tomatoes with some flavourings, the flavour is not strong enough! 4. How much prawns per person - I cater for 100g / 3.5 oz of prawns per head which I think is a good size for starters. But you can be as generous as you want! 5. Prep time assumes you use already peeled prawns. I peeled my own - it takes me about 15 minutes to peel 1 kg / 2 lb of medium sized prawns (about 45 I think), but I've had practice! Line up the family at the kitchen bench and make a production line out of it! 6. Sauce recipe by Neil Perry. 7. Make Ahead: Peel prawns and place in airtight container for up to 24 hours (the fresher the better). Make sauce and refrigerate for up to 3 days. Assemble just before serving. If you assemble more than say 3 hours ahead, you'll end up with sauce pooled on the lettuce. I assembled it 5 hours ahead and had that problem - still delish and still enough sauce on the prawns, but there was more sauce than ideal pooled at the base of the glass. 8. Nutrition per serving, assuming 6 servings. See? I told you it was a beautiful day today. 🙂 Dozer is gagging to get to the beach so I’m signing off! This recipe looks amazing. Is it ok if I assemble about 6- 7 hours ahead of time if the prawns are on lettuce cups? Hi Theresa, You might find that the lettuce goes limp – I find salads that have dressing on them never keep well! This looks so delicious!! I only have prepared horseradish though…do you think it would be okay? Hi Nagi! 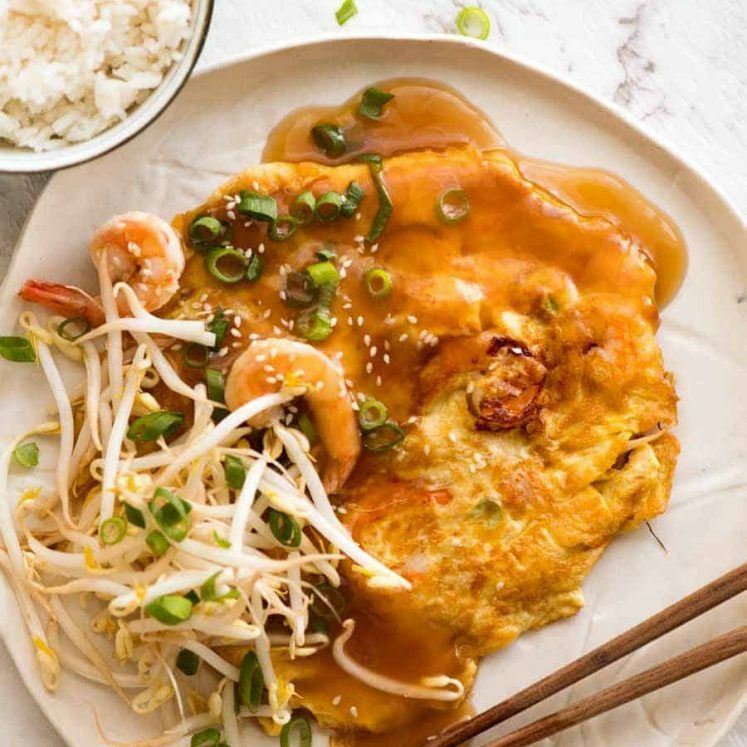 This looks delish… But we get only raw prawns here in India. How do you cook it?? Hi Karishma, you can simply boil the raw prawns and cool them! Thank you for sharing your recipes, I am from Singapore. I have been following your blog for a long time. I had requested for your e cookbooks several times, but until today have not received, am disappointed. Will you please email to me? I discovered your blog about halfway through the year, and have now made so many of your fabulous recipes. Thank you for your care, effort and enthusiasm in creating the Recipe Tin Eats and for inspiring me back into my love of cooking! I’m using your recipes for our Christmas lunch and have just made the seafood cocktail sauce – yum! Wanted to wish you, your mum and family and darling Dozer, too, the happiest of Christmases and a fabulous 2018 🙂 Looking forward to continued cooking adventures … thank you. Wow to Dozers life!! Nagi yumi, nice and Light, Fresh, love IT. Must share with YOU My Luck! Friend brought me goodies from her garden, bag Of herbs, rosmary, two tapestries Of mine , kafira leaves , garlic, grapefrut and last is the best home grown Blackberries!! Done Cooking for her, risottos with mushrooms and smoke salmon and givinkomquat from Liquer for fruit cake. But there is more. Dear Neighbour brought me bag Of home grown broad beans, My fingers Are ALL twisted, piling them double ! But ALL is good. Inreturn givin home Made marmelade.! Wish YOU Were here so we could share! Regards, Vera. WHAT IS A RECIPE FOR THE PINK SEAFOOD SAUCE I CAN SERVE WITH PRAWNS IN LONG LEGGED GLASSES I HAVE. This is what I call ease appetizer now for the holiday. Looks so delicious! A classic! Makes me think of my mother and want some right now. 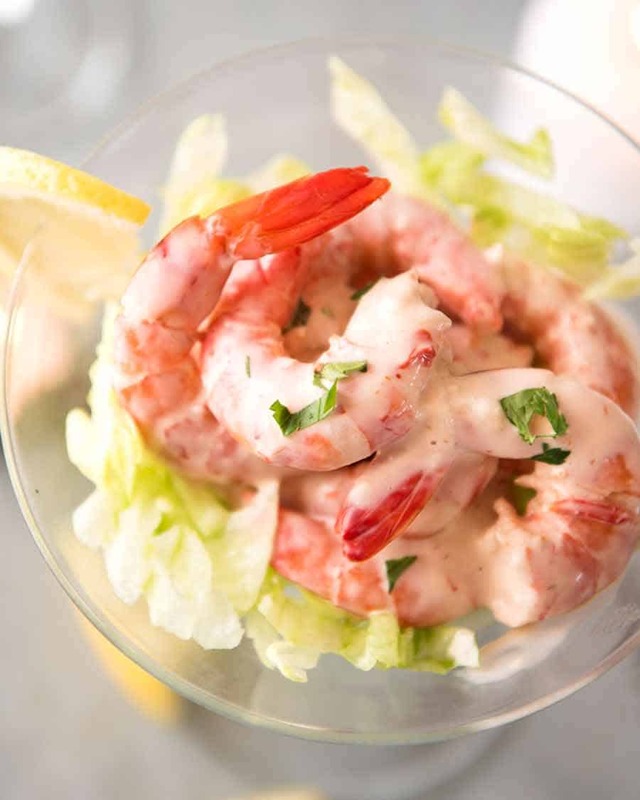 The water looks beautiful and so do your shots of the shrimp salad. We love our shrimp and I agree, about feeling that a shrimp cocktail makes one feel like it’s a special occasion. And smarty you went even further and put it in a fancy glass. When we make our sauce it is more of a tomatoey, horseradishy, lemony sauce. We’re fortunate to get fresh wild caught shrimp which are amazing! I’ll have to try your sauce, we do like our wasabi. Have a great weekend – Dorothy must live around the same area I do, it is 24F here. Dorothy Dunton, I live in Aust. as well and I make all sorts of spice and herb mixes that can only be purchased in the States including your mentioned “Old Bay” and Mrs. Dash as with many more and use them almost daily. I’ve been astounded every time I visit the States and walk through the supermarkets there compared with what we have here. I only wish the companies here would build their stores twice the size they are to accommodate the amount of FOOD stock variety you guys have and that’s just groceries without all the other stuff they stock. Hi Josephine – I hear you! ? The selection of spices over there – especially the variety of Mexican spices and seasonings – is SO GOOD!! And condiments too. You should have seen the suitcase I brought back last time I came back from the states…..jam packed not with shoes and clothes, but cans of green chillies and spices!! Hi Nagi, I didn’t think we were allowed to bring food back into Australia, so I’ve never tried since there’s so much one has to declare and I don’t want to have anything confiscated since I’ve paid good money, so I don’t bring food in. I’ve made so many spice and herb mixes though from “copy-cats” type and find them very good, even though I don’t know how the original may taste, but the copies will do me fine as I presume they must be very similar. I love your page as it keep my mind wondering and taste-buds salivating. Just keep them coming as I rarely make the same thing twice because there’s SO MANY BEAUTIFUL dishes (meals) I want to try and you don’t give me much of a chance to make them more, unless my hubby says “That’s flippin’ GOOOOD”.